Figure it's time to start a thread for this. I'd been toying with the idea of making my own poured silver for a few years now. I never got past the initial planning because I always figured I'd end up burning myself with liquid silver or smashing fingers trying to stamp the ingots. Thankfully I talked to David (of YPS fame) and he was willing to do all the hard work for me (and do it much better then I likely ever would have). So here we are. 2018 has seen my first few ideas turned into silver. What's "different" about me/this is that I don't expect I'll ever make any money on this little side hobby. The first run (my 2018 1oz) I simply had a mintage of 69 made and delivered to me. Simply to enjoy (though since then a few persistent souls have managed to get some of those off me). Now my second design is out and that one will be sold just to benefit the trackchair fund we here at BS have going to help a wounded veteran. So basically I'm just spending money on stamps to see stuff I think up in my head be put on silver, and don't much care how much I lose doing it. I don't plan to do much selling....though I like the idea of selling some for good causes. Last edited by Silversaving on Thu Aug 30, 2018, edited 1 time in total. Currently up on the YPS site is the latest. A 2.5oz (cause I like odd numbers) pour. These will be available until either the end of the year or until David gets sick of hosting them and they come down. $10 from every bar sold will go directly to the trackchair fund! Ordered. Thank you for offering and doing something for the trackchair project. 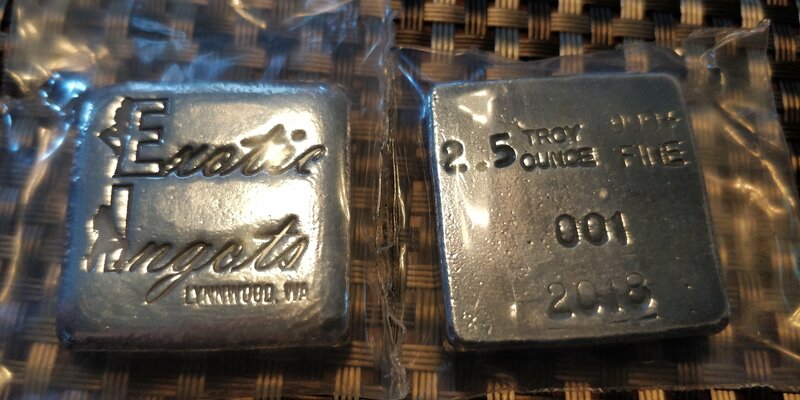 "2018 1oz: 69 +3 prototypes +5 antiqued (damned co-workers demanded those last ones)"
Soooooo, what do these look like? And thanx, ditto what Static said. Brick's wrote: "2018 1oz: 69 +3 prototypes +5 antiqued (damned co-workers demanded those last ones)"
SilverDoge wrote: Bravo on the enterprise! Hell of an enterprise, I lose more money after every design lol. Just picked up a few of these. Cool bars for a great cause.